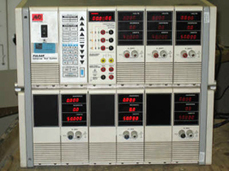 Relay testing is carried out using the Meggar/AVO Computerized Pulsar Multi-Amp Universal Protective Relay Test System, the KoCos ARTES 440, KoCos Artes 460 Programma Sverker 650 and the Omicron CMC 356 which represent the most up to date Protective Relay Test Systems. With the Meggar/AVO Pulsar, general-purpose test routines can quickly and easily create customized, automatic relay test programs for virtually any type of protective relay, of whatever manufacturer. Pulsar allows for testing simple or complex, single- or three-phase, electromechanical, solid-state and microprocessor- based relays. It is not necessary to change the way relays are tested. Usually Pulsar can substitute for manual test procedures or can easily create new test procedures where previously none existed. This holds for even the most complex relays. After a test program has been created for a specific relay type, it can be stored for recall and repetitive use. Pulsar can perform steady state, dynamic and transient testing. It is possible automatically to change voltage, current, phase angle and frequency (Including harmonics), ramp outputs and pulse outputs. Using the AVO International Pulsar Protection Relay Test Unit together with AVTS, (Advanced Visual Test Software), is the culmination of over 16 years of automatic relay testing experience. It is a totally new concept in relay testing software. AVTS is a new Microsoft Windows XP software program designed to manage all aspects of protective relay testing. 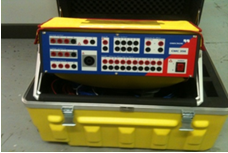 ​The Meggar/Programma Sverker 650 is intended primarily for secondary injection testing of protection relay equipment. The Sverker is capable of testing almost all types of single phase protection. This equipment is also capable of testing three phase protection one phase at a time including phase shifting and auto-reclose systems. This is however only the beginning of this universal test equipment arsenal. It is also capable of plotting excitation curves, carrying out both current and voltage transformer ratio tests, measuring the impedance and burden of protection relay test equipment as well as efficiency and polarity tests. ​Just like the AVO pulsar, the Omicron CMC356 can carry-out general-purpose test routines and quickly and easily create customized, automatic relay test programs for virtually any type of protective relay, of whatever manufacturer. The CMC allows for testing simple or complex, single- or three-phase, electromechanical, solid-state and microprocessor- based relays. The advantages that the Omicron would have over the Pulsar or the Artes 440 would be its capability to test the low level inputs of ABB relays series REF 54x (unconventionalTransformers & Rogowski coils). ​The ARTES 440/460 is similar to the AVO & Omicron systems but in addition to relay testing, has the facility to test voltage, current, and all types of power transducers. 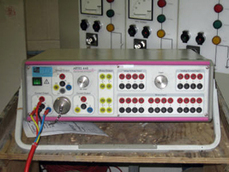 The ARTES 440 II is a highly precise, portable measurement system especially designed for the functional testing of various types of protection equipment, such as distance protection relays, for example 6 current and four voltage outputs with a particularly high output power allow the three-phase testing of both digital relays and electromechanical relays (still used predominantly) as well as of differential protection relays without additional equipment.